Got it. Now close this. Written by Liz Mallen. Photos by Ted Bell, Dan LaRiviere, Steven Lloyd, Liz Mallen. Published on November 12, 2017. Read all the shout-outs here. 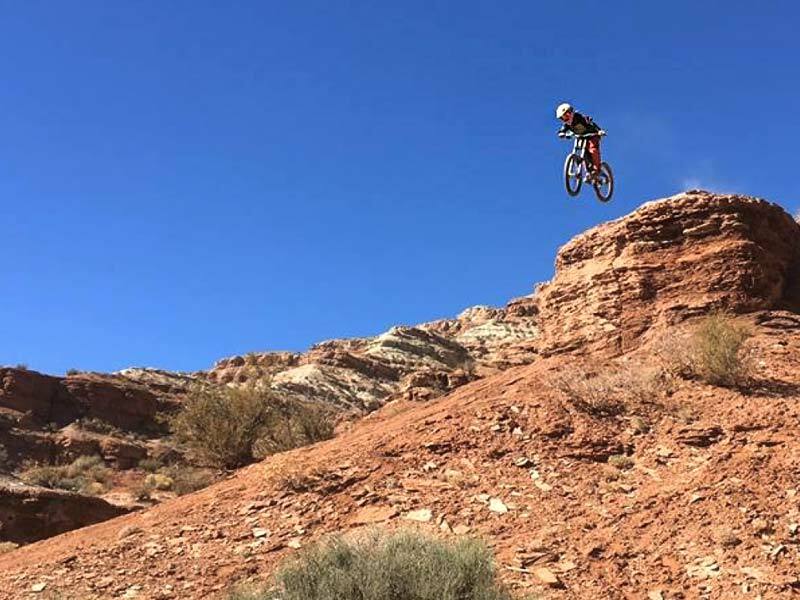 Freeride mountain biker Cam Zink, one the the many fan-favorites, backflips his bike at the 2017 Red Bull Rampage near Virgin, Utah. Photo by Liz Mallen. 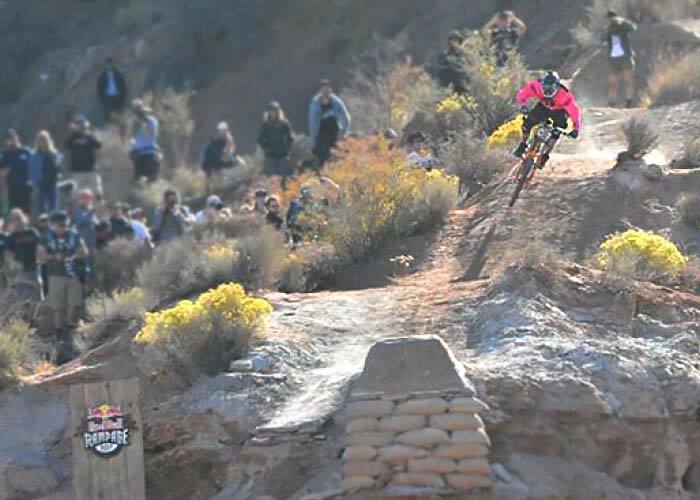 WHAT IS THE RED BULL RAMPAGE? 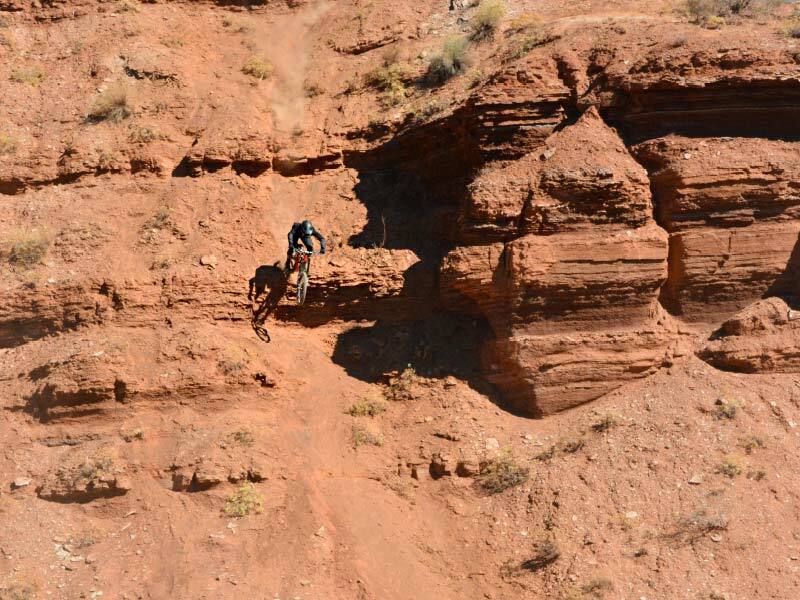 Red Bull Rampage is an invitation-only freeride mountain bike event hosted just outside of Virgin, Utah. This year, riders on Finals Day consisted of 18 incredibly talented athletes from around the world. 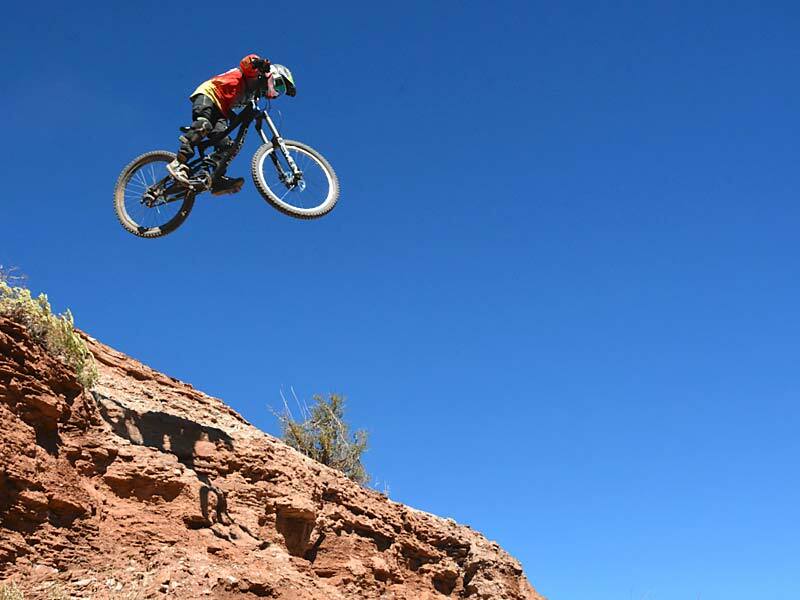 Red Bull Rampage is THE mountain biking event to watch. 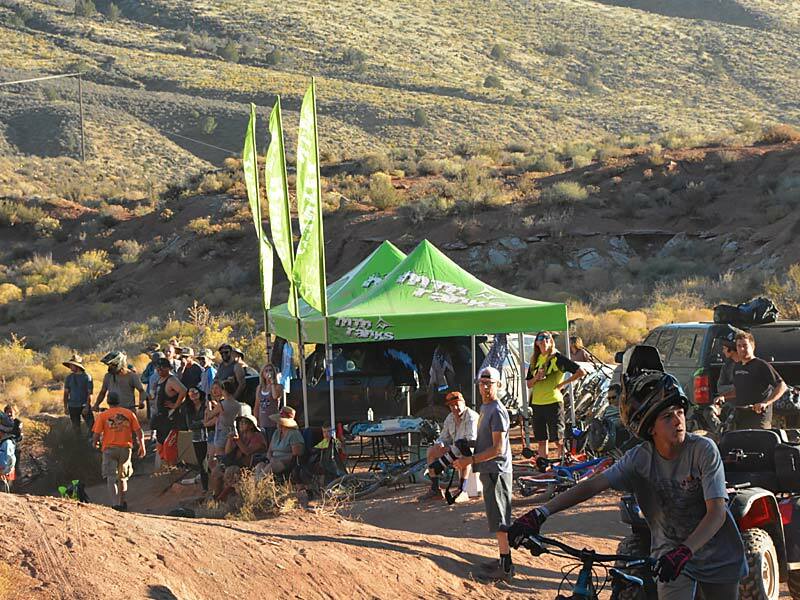 It is the “Superbowl” of freeride mountain bike events. There are many kids who attend the event with their families, dreaming of some day receiving the same invitation to ride with the best. 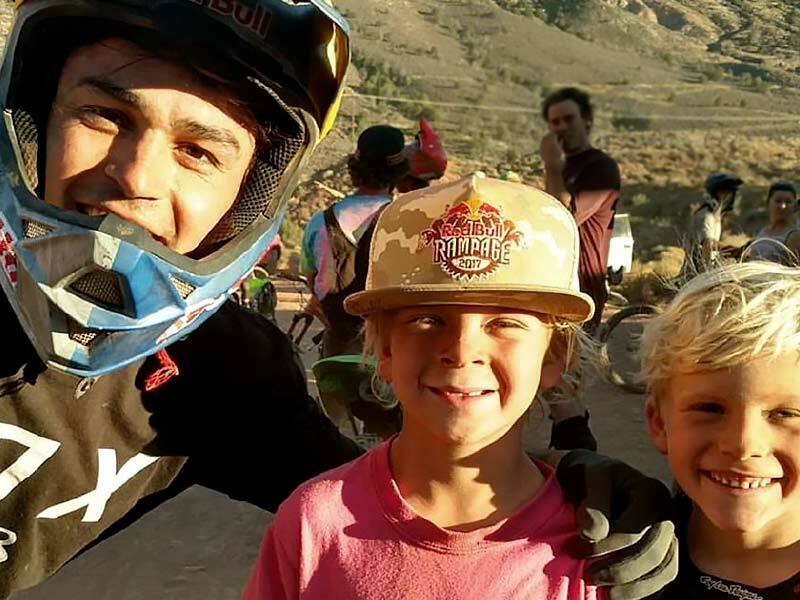 The kids, who at home pour over YouTube videos and Instagram, looking at great ones like Cam Zink, Andreu Lecondeguy, Kurt Sorge and Graham Agassiz for inspiration. What new trick or air are their role models are coming up with? And, will the kids be able to copy it someday? We pulled into the Zion River RV Resort at midnight, Wednesday before the event. With all intentions to have arrived about 8 hours earlier, the whole “I have to work” thing got in the way. So there we were, setting up in the dark…shusshing each other, as to not wake the other campers. I look at my husband and ask, “Do you think they turned the sprinklers off yet?”. Twenty seconds later we hear the familiar “poppshhhhhh” of water. So there we were, setting up in the dark, in the sprinklers. 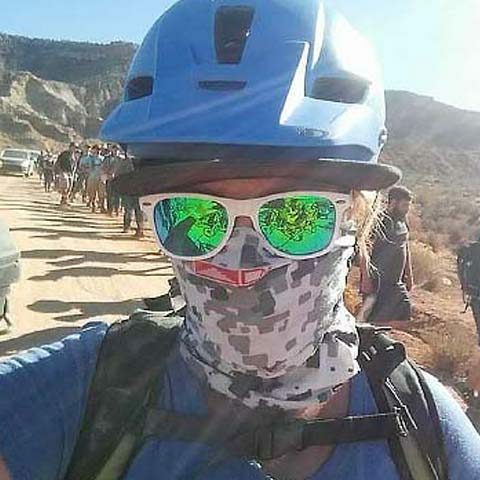 If you choose to stay at the resort, make your reservations (even without tickets), the minute they release the dates of Rampage, as their spaces reserve quickly. 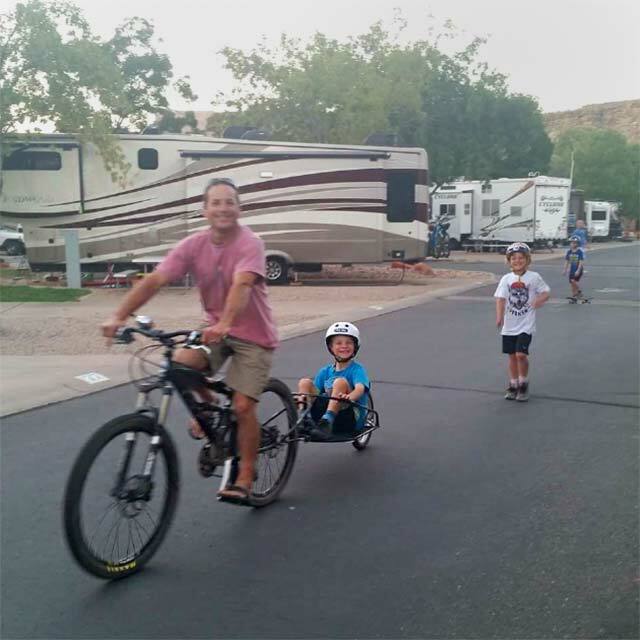 We have stayed here for the past few years as they have a pool, beautiful clean amenities, and just made it easier to be hooked up in the RV with the kids – especially when they were smaller. They also have a list of fun events happening in the evenings, such as movies, Halloween Bingo and other fun contests for the kids in the clubhouse. A word of warning however, they are very strict on their rules, and asked that the kids not ride their bikes after dark or go in the hot tub if they are under 18. If you, or your kids choose not to abide by the rules, they will ask you to leave. Testing the Bob trailer. Photo by Liz Mallen. A little camp fun! 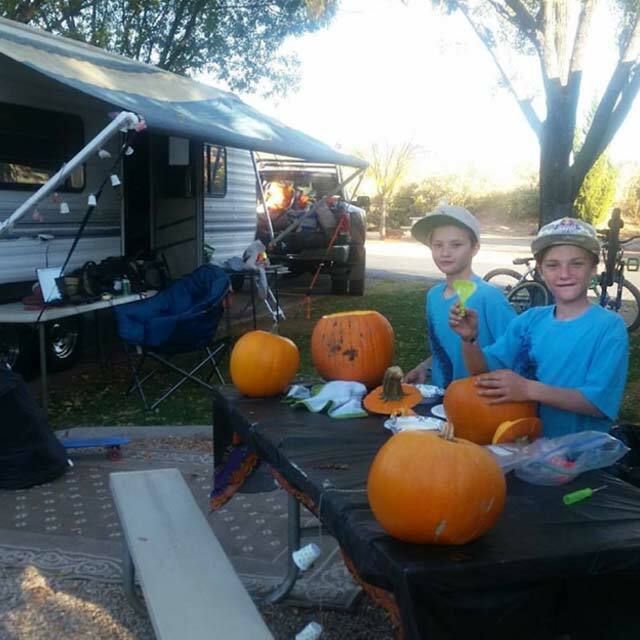 Rampage usually falls around Halloween making it extra special for these kids. Photo by Liz Mallen. This is always a small source of anxiety, as in years passed, they sold out online in 5 minutes. The key is to follow all of Red Bull Bike social media channels, and then be poised and ready the minute (or before the minute) they are released to buy on the chosen date and time. You will only be able to purchase two tickets at a time, and must match each ticket by name to each family member. Once you have your ticket confirmation, it is a good idea to actually print them out in case anything were to go awry. A few days before Rampage, the actual tickets are released. Again, be sure to print them and have them in hand, as there is no cell service at the gate. When you finally arrive in Virgin, it is a good idea to pick up your wristbands and any swag you want to purchase the day before the event. This way you are not scrambling at the last minute at 7 am in the morning to get your proverbial stuff together, and out to the venue. Some of the coolest swag sold out this year by Thursday evening! We were lucky to pull in right as the ticket checker station opened. The kids do miss a few days of school, but as they have become older, we find that Rampage is a good motivation for them. The kids and parents showing off their wrist bands and Rampage swag. Photo by Liz Mallen. Grateful for some shade in the desert! Love our Manta pop-up tent!. Photo by Liz Mallen. Unlike a lot professional sports and events, the athletes strive to be accessible. 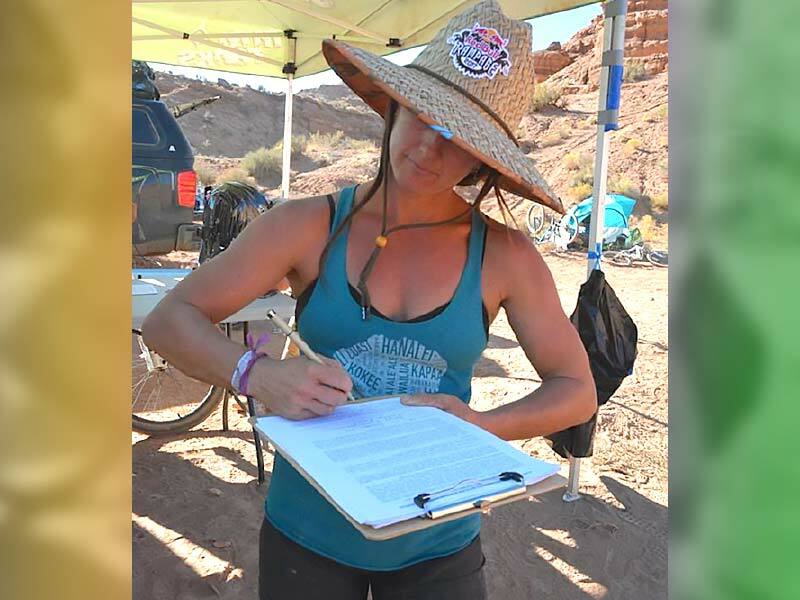 Bring a marker and items for them to sign. In the past, we have brought: hats, posters, race plates, helmets, photos, and magazines. We put a Sharpie marker on a lanyard so they don’t have to worry about holding on to one more thing as they are billy-goating around the site. If you really want to get into the event – accessorize and bring bells, noisemakers, glitter and costumes! My friend and I remarked one year, as we were perched on the edge of a cliff surveying the madness, that this was the closest to Burning Man we would ever get. It is a looonnngg hot day. 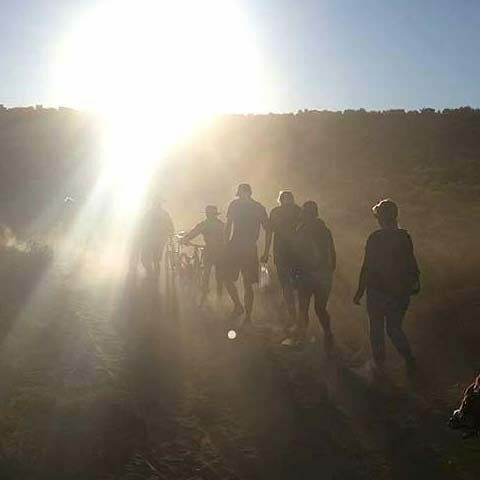 The ride out us about 3.5 – 4 miles on a very moon-dusty road, one way. It is a gentle pedal up out there with a few tricky spots here and there. 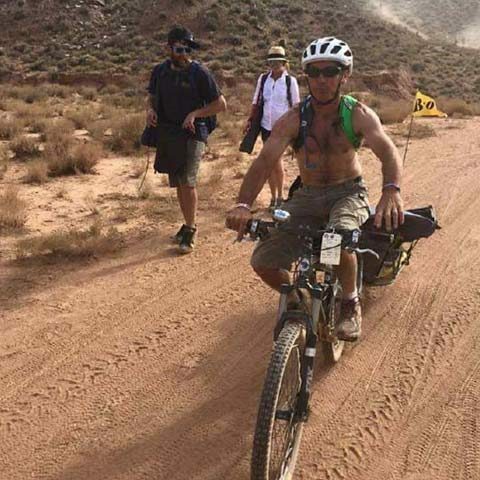 My husband attaches a Bob trailer to his bike and we load in all of our gear, including a small bbq and brats, our drinks, chairs and shade and of course a trash bag. With all the kids, it takes between thirty minutes, and an hour. 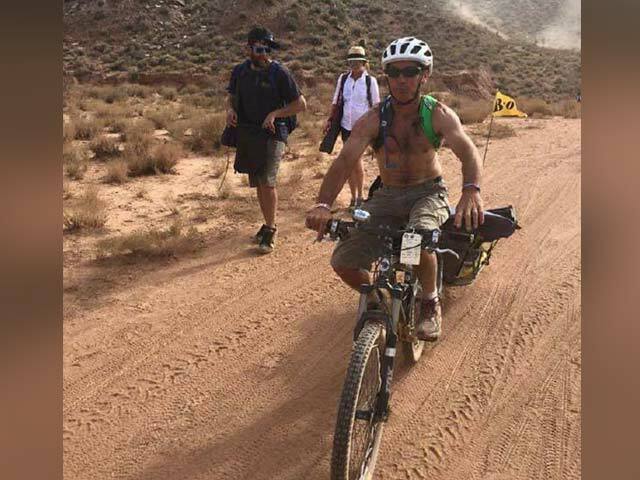 We usually have someone speedy in the group, they cruise out ahead, and stake down some land for the rest of us. With a collective deep breath, the first rider of the day, Brett Rheeder took his first run at 10:00 am. I don’t think a person can really understand the physics of what happens in this little area of the desert on this particular day. Until you are able to see it for yourself – it is something to put on the bucket list. These men are some of the most incredible athletes in the world. The pure physical and mental strength it takes to perform these maneuvers is mind-blowing. 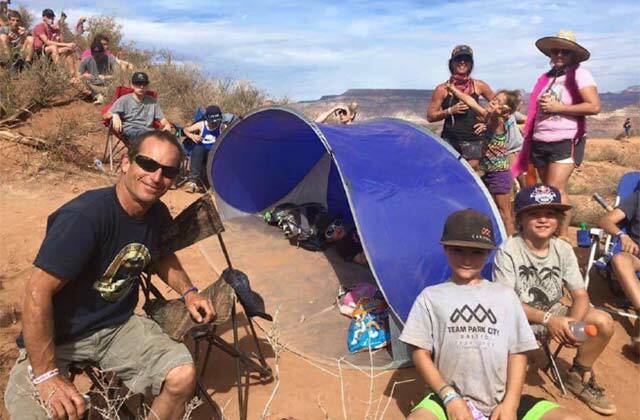 The fact that just after these guys come down, from literally risking their lives, they make it a point to sign and take pics with their smallest of freeride fans, proves their dedication and love for this sport. Can you name all the pros shown below? Click on each image to show the rider’s name. These professional athletes are some of the nicest guys in any sport. I think all the kids were levitating (and maybe some of the dads). 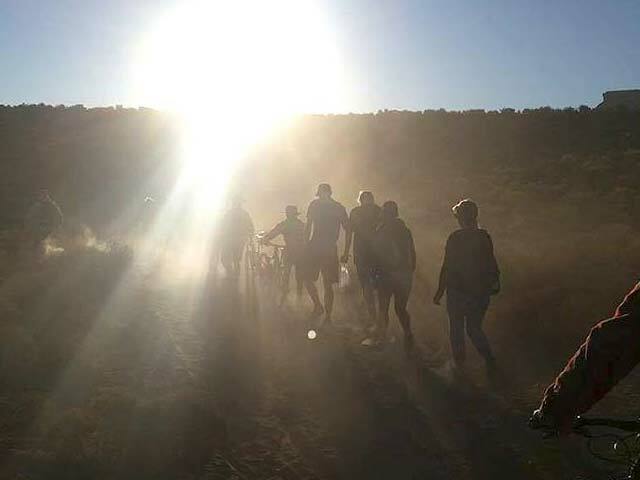 This year was the largest year for the kids, with most of the Outlaw Bike Team present, as well as a ton of other groms running around, for the sport of freeride mountain biking, it looks like a promising future. The moms had just as much fun, although as we were watching all of this unfold, we could not help think that maybe our kids some day will be the ones in the start gate. Liz Mallen and her twin boys - Luke and Alex. 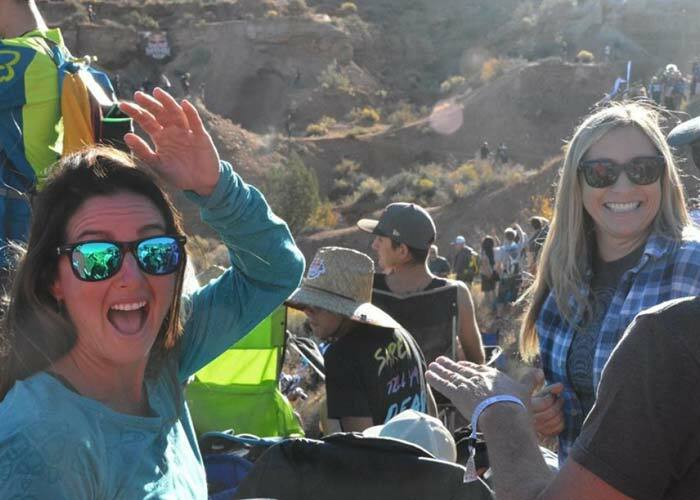 Tricia Kirschenmann (Finley's Mom) and Sarah Flinders (Dillon's mom) are all smiles at Rampage! I have had the chance to chat with some of the athletes about how their mom’s feel. It seems a lot of them choose not to watch. This year however, Brett Rheeder’s mom was in the audience for the first time. Apparently she had a hard time even watching it live on tv! A few years ago, I had the chance to talk with Graham Agassiz about how his mom felt. He said she wanted to watch, but he felt better, and less nervous when his family were not there in person. 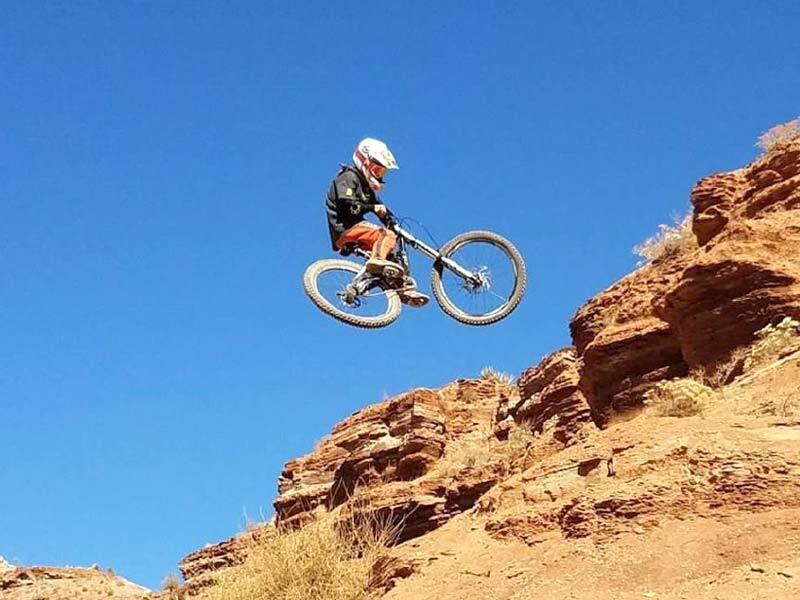 As a mom of kids who are interested in pursuing this sport, I can begin to understand what it is like to watch your child drop backwards and upside-down and over the edge of a 50-foot cliff… on a bike. We are already beginning to experience that feeling, on a smaller scale, for now. 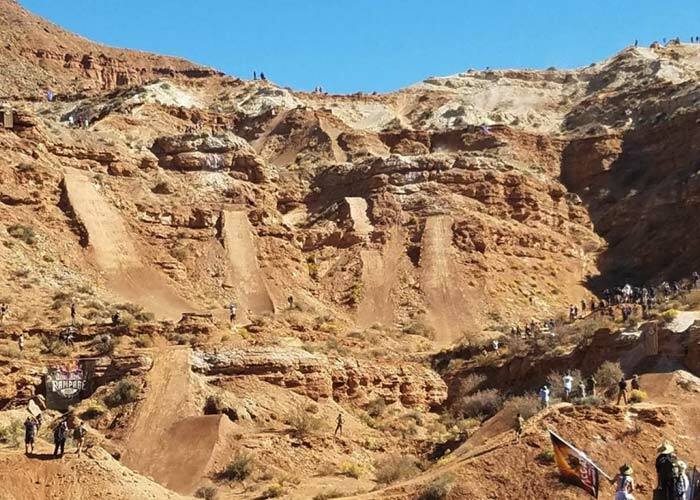 Utah local Logan Binggeli sending it in the middle section of the venue. Photo by Liz Mallen. Drops for days... where the big kids come to play. Photo by Liz Mallen. The kids watching it all unfold. Photo by Liz Mallen. Spectators line the edges of the freeriders' lines. Photo by Liz Mallen. 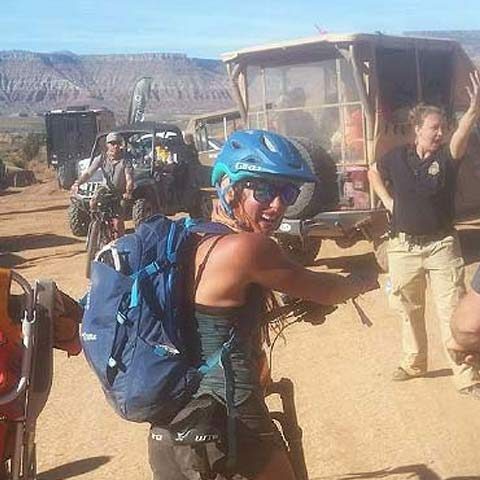 As the event played out, you could see that the gloves were off between these heavy hitters in the freeride mountain biking world. The main competitor in the past being the wind, this year, luckily it did not make an appearance allowing the guys to send all of the massive tricks they had planned out for their runs. This was also the first year there were no catastrophic crashes or injuries. Everyone was happy about that. 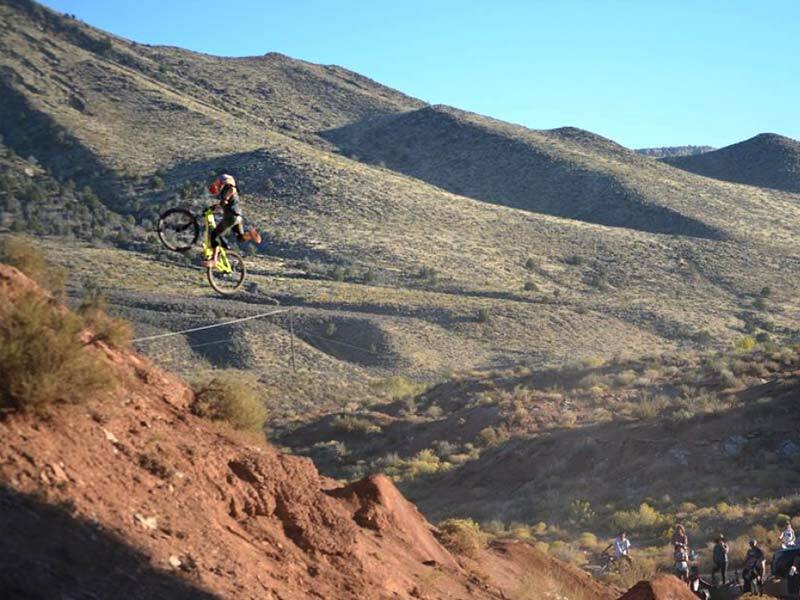 Kurt Sorge wound up on the podium in first place for the third time. 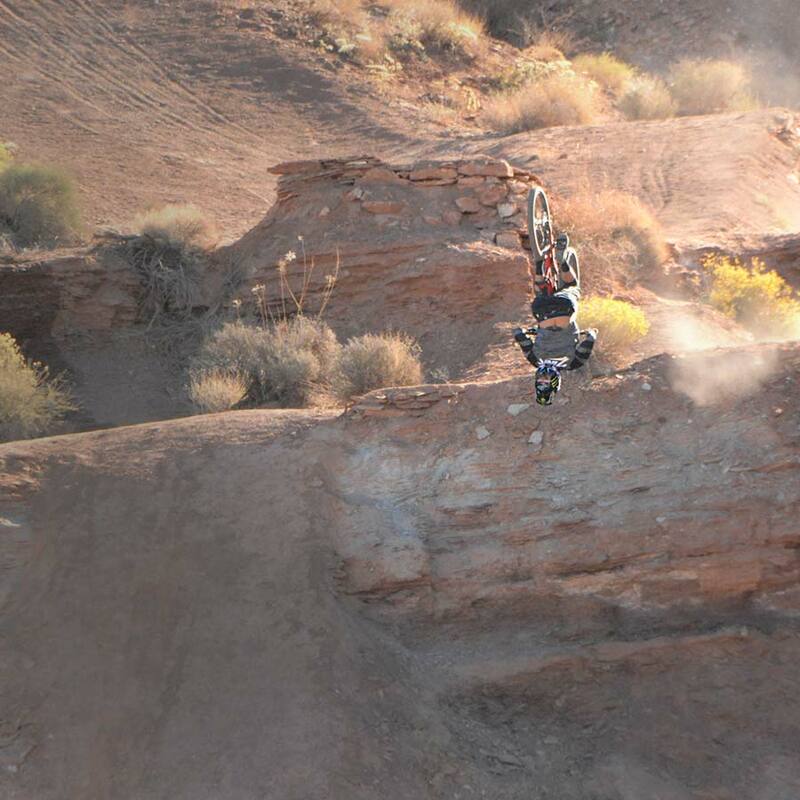 Throwing down some massive flips, and a smooth run, he earned the top spot with a total score of 92.66 . 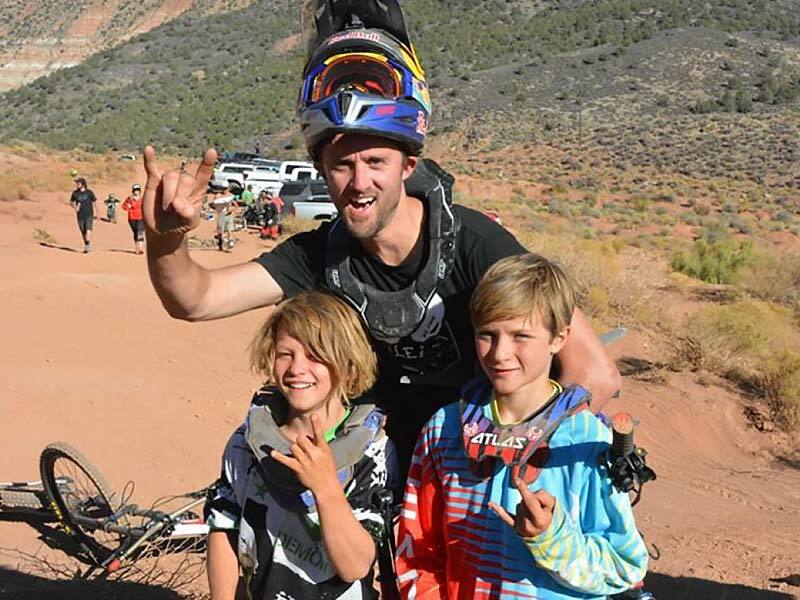 Proving to the world that he is the one of the best, and can still hold his own after fathering two kids, family man Cam Zink stomped into Second place with a hair raising run down one of the steepest chutes in Rampage history named “The Scar” He then proceeded to back flip off his drop, before the road in the same steep upper section. An emotional Cam was seen blasting through the finish of his first run into his wife’s arms. Cam’s bike unfortunately got away from him on the second run as he attempted a front flip in the bottom section, leaving that top spot just out of reach and in the hands of Kurt Sorge. 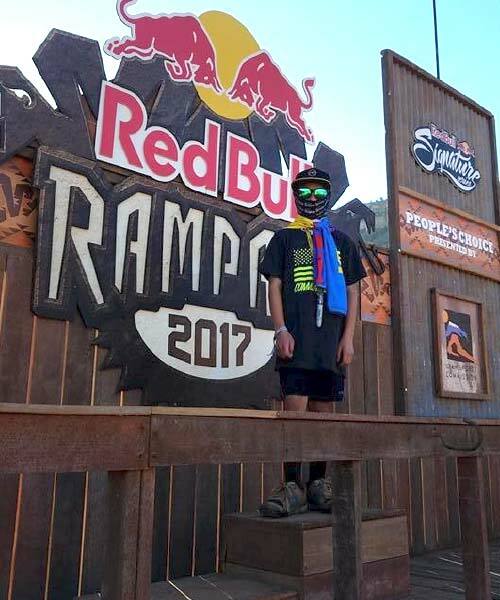 Local Utah resident Ethan Nell, threw down and claimed his stake on Rampage 2017, and wound up in third place, solidifying him as a new force, and someone to be reckoned with in the years to come. Antoine Bizet earned the People’s Choice Award with one of the “flowiest” runs of the day. 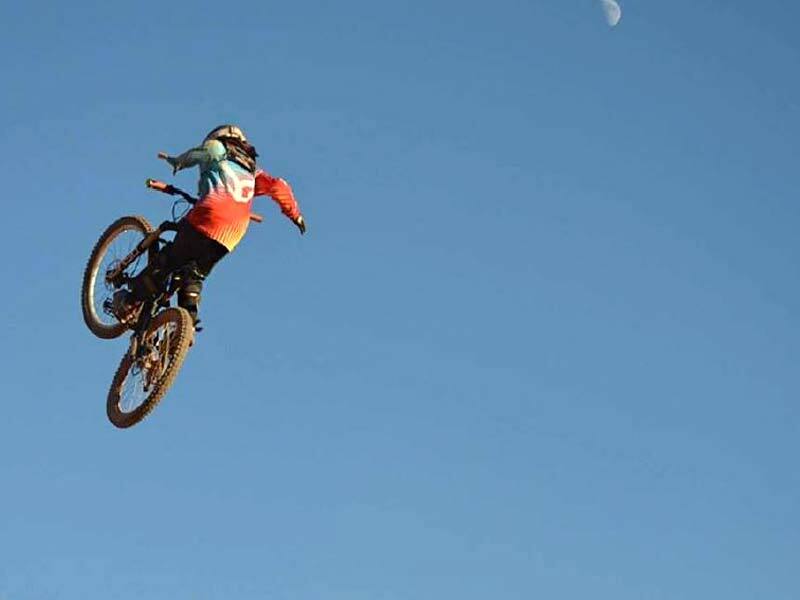 Commencal team rider Pierre Edouard Ferry earned the McGazza Award for channeling the late Kelly McGarry’s enthusiastic and aggressive style. Winner, winner chicken dinner! 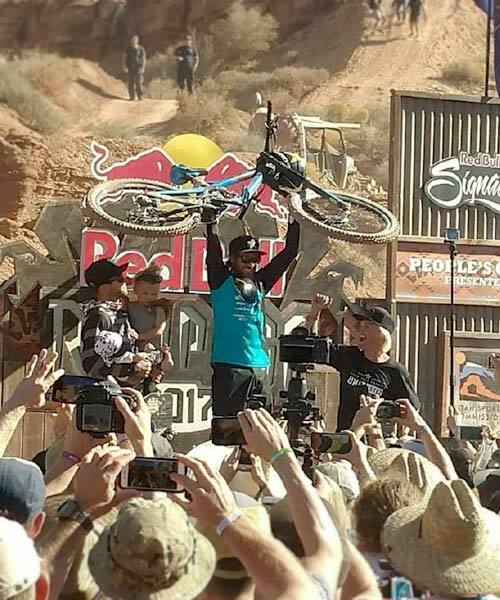 Kurt Sorge in the top spot on the podium.. Photo by Ted Bell. Luke on the podium... some day? Photo by Liz Mallen. WATCH A REPLAY OF THE EVENT! 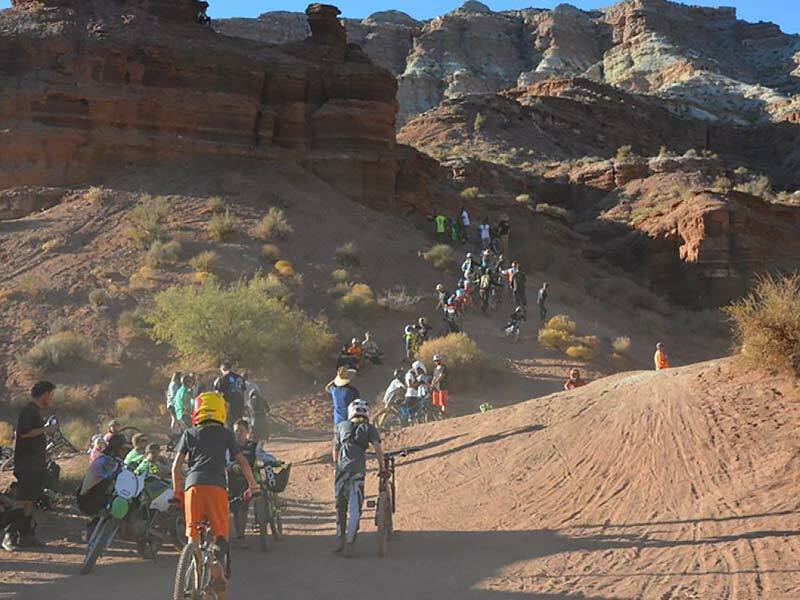 In the end, it was one of the most successful Red Bull Rampage events to date. 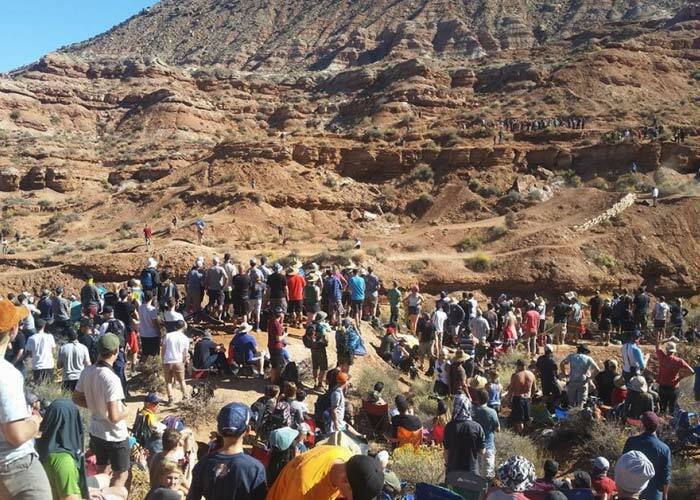 You can watch the live replay on Red Bull TV, and see what all the insanity of the biggest event in the sport of freeride mountain biking has to offer. 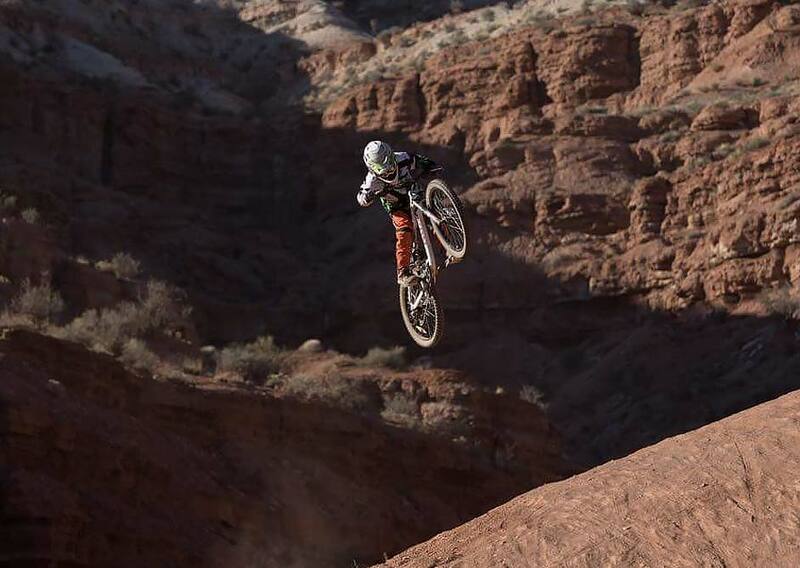 Rampage is part of the Red Bull Signature Series, and will air a highlighted program on NBC Sunday, December 24th. Happy Holidays! 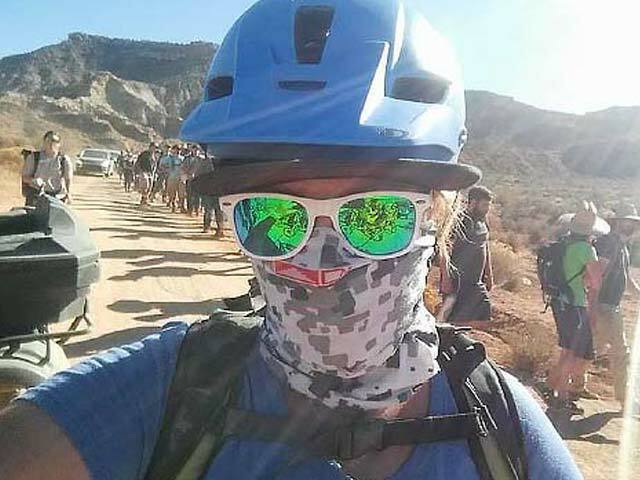 The day after Rampage, there’s a lot of excitement and buzz in the air. 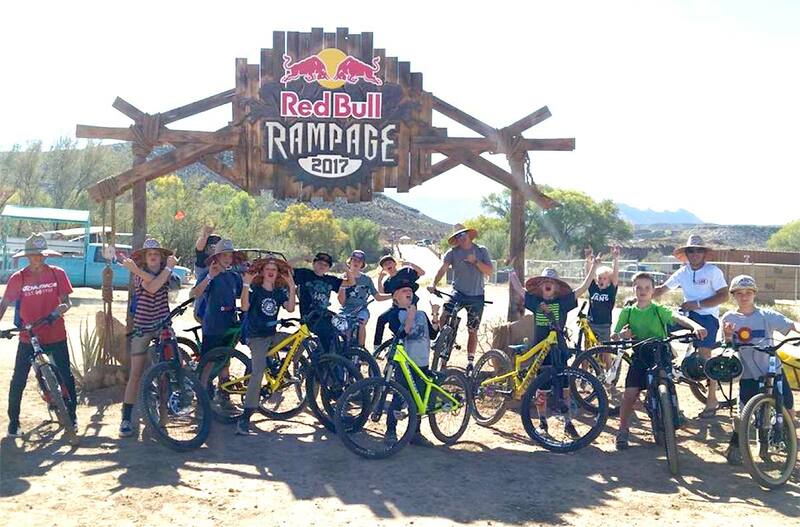 The kids, fueled by the big show the day before are ready for the chance to go out and mimic their idols at the original Red Bull Rampage site. MtnRanks, a lifestyle clothing company based in Park City, Utah, puts on an event every year called MtnRanks Fanpage. 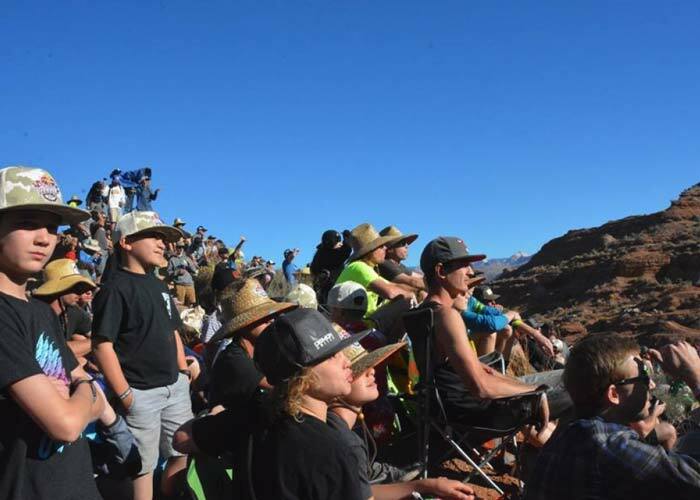 It’s “Freeride for the People!” They bring music, give-aways and cold hard cash for the sick tricks performed by the fans of Red Bull Rampage. 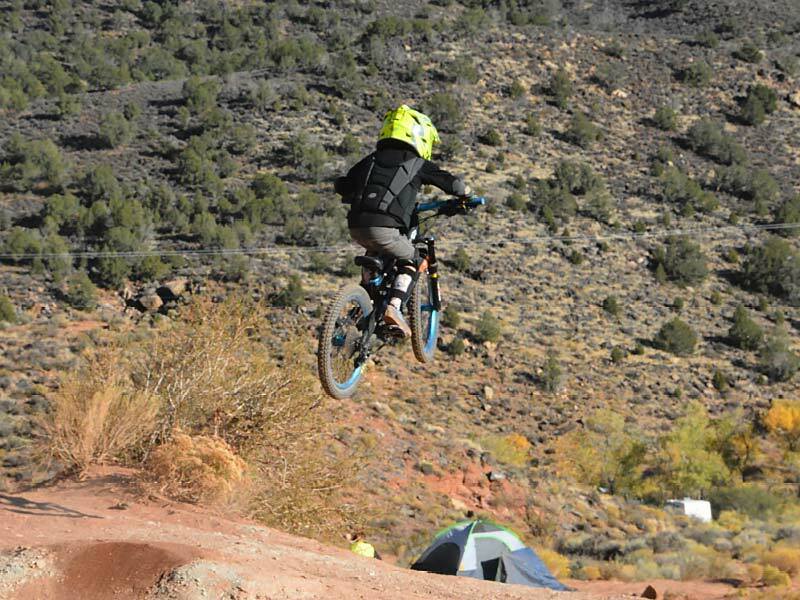 Alex Mallen boosting at the MTN Ranks Whipoff 2016. Photo by Steven Lloyd. Follow Steven on Instagram at @stevelloydphoto and his website at www.stevelloydphoto.com/. Our friends from Worldbikeparks.com wanted to get some shots of the groms, so to gather them all together (as it is like herding cats), we decided to initiate an “Unofficial Grompage Ice Cream Social”, which took place just before the main event. Grabbing some ice cream and bowls, we were able to get the kids to sit still for a hot minute before they sent it on the dirt jumps showing some of the heavy hitters in the industry what they were capable of. Needless to say, they turned some heads. People such as professional adventure photographer Steven Lloyd captured some amazing shots. Steve, a father of two sons in this “grom army”, is right on point with photos. This year we were able to bring it together again, and have the kids and the adults show off their stuff at the same time. This year, we also had some of the companies that sponsor the kids donate some awesome gear for the multitude of groms that show up and strut their stuff. A big thanks to Demon United and Zoic Clothing for the grom-sized swag additions! Some sweet body armor was presented to some of the smaller kiddos, who were really stoked! Just before the event, continuing on the tradition started last year by our friends Natty and Trey from Worldbikeparks.com, we decided to have an ice cream social. 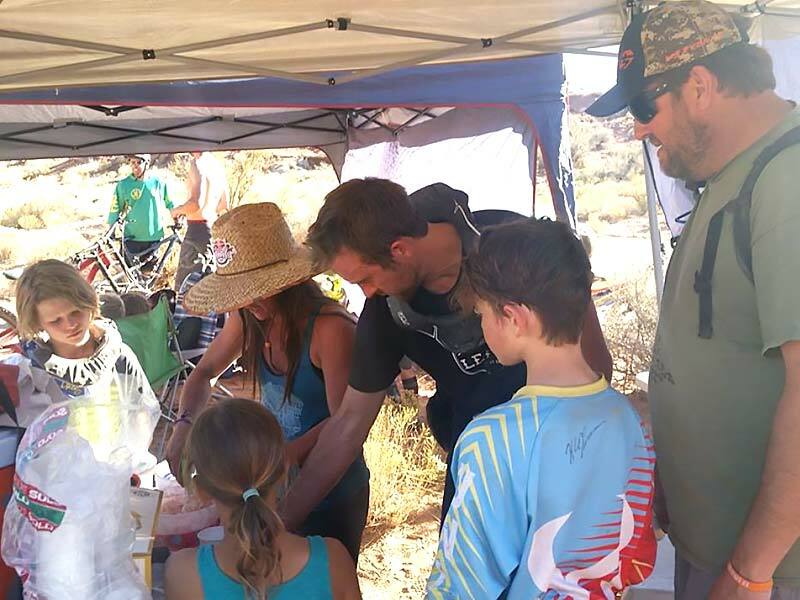 Celebrating all the groms who want to get into the sport of freeride mountain biking, and get them all together (and give them a little sugar boost). Andreu Lacondeguy watching grom talent from above, wondering who will be nipping at his heels in a few years!. Photo by Liz Mallen. Nico Vink hanging out after the boys finish a session. Photo by Liz Mallen. Aaron Chase with the groms. Photo by Liz Mallen. Aaron Chase about to enjoy a little ice cream in the desert. Photo by Liz Mallen. The Groms Were On Fire This Year! 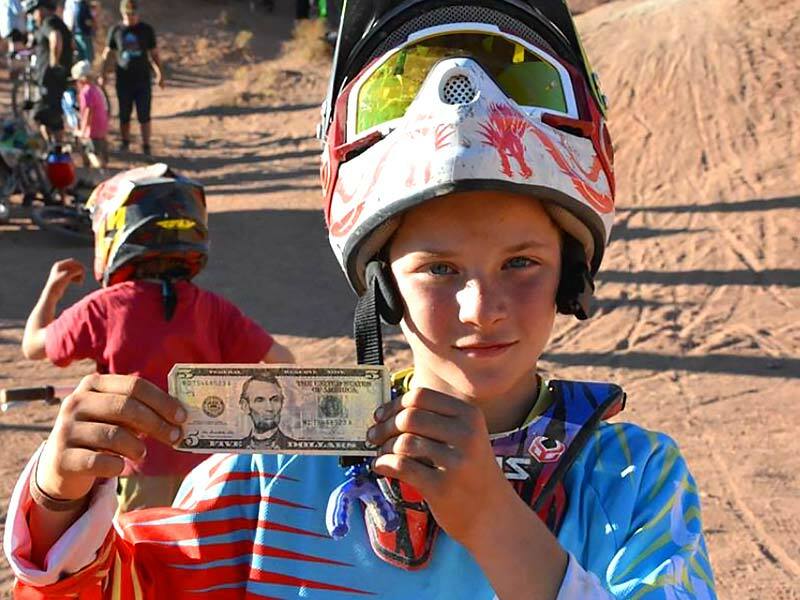 The young shredders are earning their places in the desert among the MTN Ranks Fanpage fans. It was full-on entertainment. Lots of tricks happening. Photo by Dan LaRiviere. 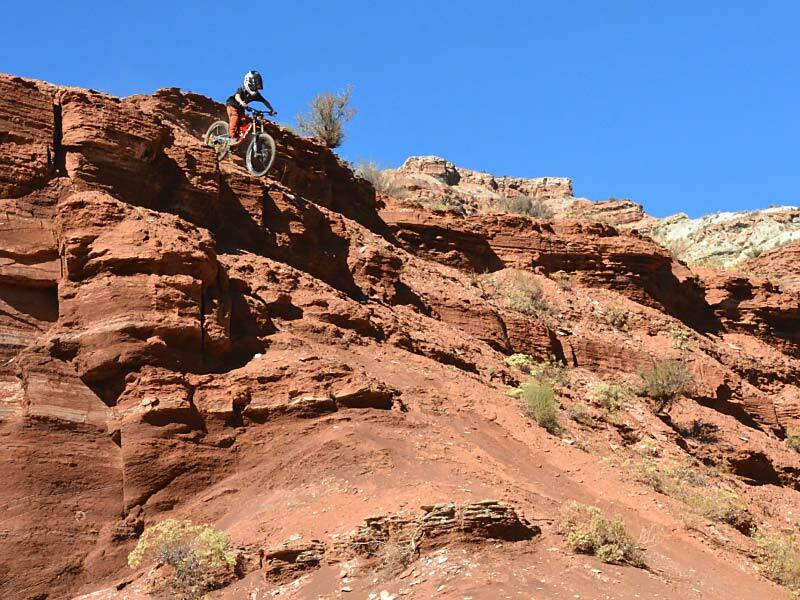 Pushing bikes to the top of the kickers at the old Rampage site. Photo by Liz Mallen. Getting a little fatherly advice. Photo by Liz Mallen. 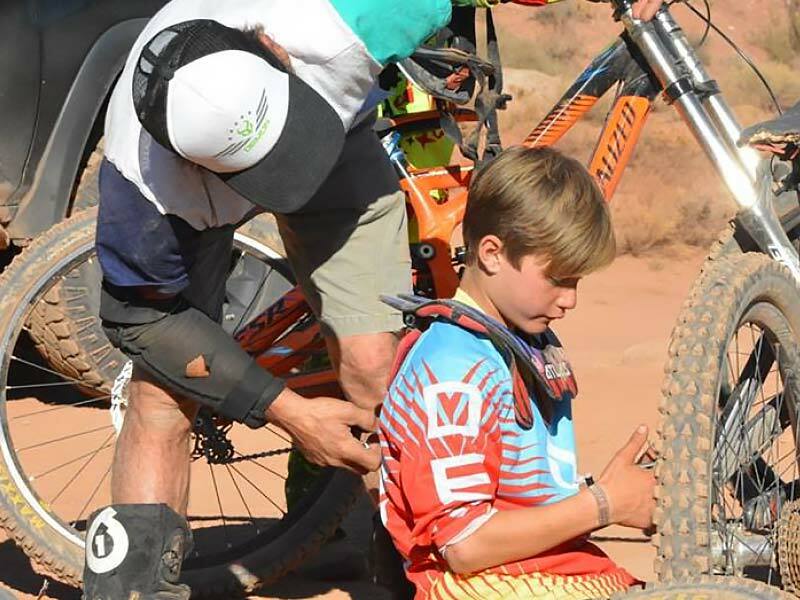 Adjusting a grom's neck brace. Photo by Liz Mallen. Andreu Lacondeguy waiting in line for his turn to rally with the kids. Photo by Liz Mallen. Andreu poses for a photo with some of his youngest fans. Photo by Ted Bell. Learning to fly. Photo by Fred LaRiviere. The groms are setting the bar high. Photo by Liz Mallen. Whip it – whip it good. Photo by Liz Mallen. Money talks! Photo by Liz Mallen. 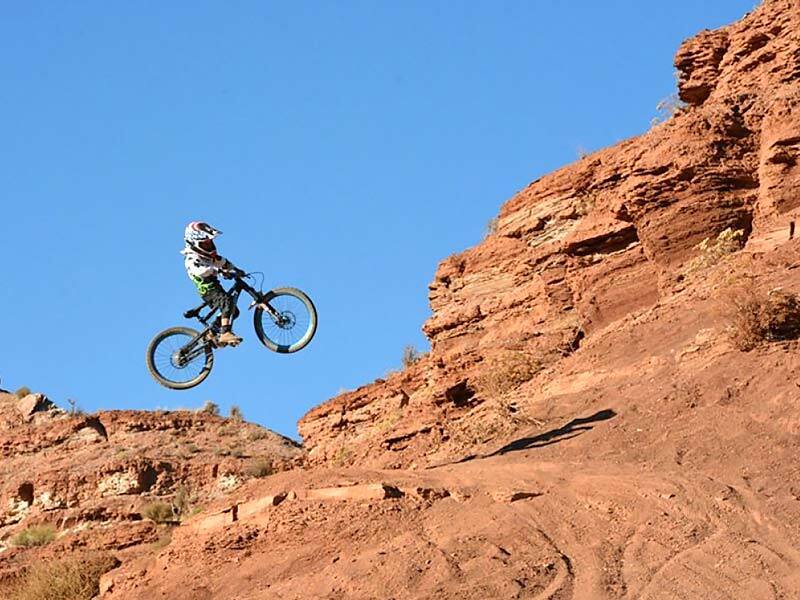 Commencal Development Team rider Dillon Flinders finding some vertical terrain. Photo by Liz Mallen. No sign – no ride. Tricia signing the Fanpage waiver. Photo by Liz Mallen. Fred Lariviere showing off one of his signature one-footed moves. Photo by Dan LaRiviere. Two of the youngest shredders in the group, but don't let their size fool you! River and Sam send it!. Photo by Liz Mallen. Clearing the big step-up like a pro! Photo by Liz Mallen. 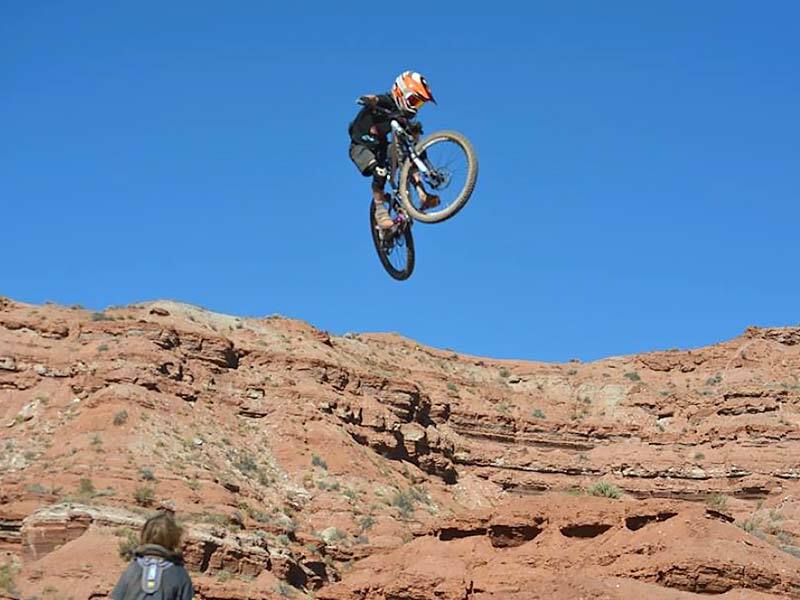 Finley Kirschenmann channeling his inner Kurt Sorge. Photo by Liz Mallen. Luke Mallen spotting his landing on one of his favorite drops at the old site. Photo by Liz Mallen. Alex Mallen drops “Canadian Bacon” Photo by Dan LaRiviere. With all of the media surrounding these kids, it is no surprise these kids have caught the eye of a few companies. 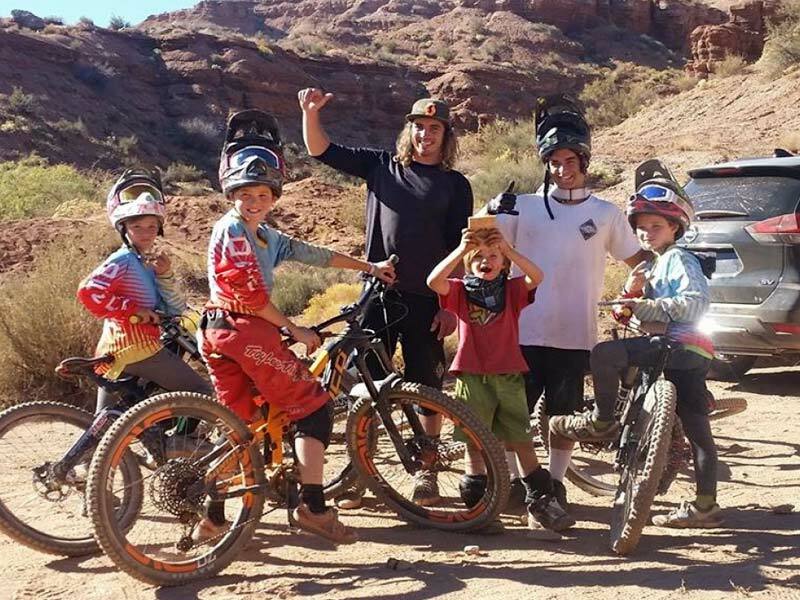 Under the watchful eye of coach Tyson Henrie, leader of the Outlaw Bike Team, these kids have been invited to be a part of Commencal USA bike Rider Development Team. They have also caught the eye of several other companies who have shown interest in working with the kids. Demon United, Poc, Magura USA brakes, Kenda Tires, Zoic Clothing, Level 9 and Leatt Protectives to name a few. Exciting things are ahead for all of them and with the guidance and support from family, friends, coaches and companies, this next generation of grom freeriders are ones to watch. 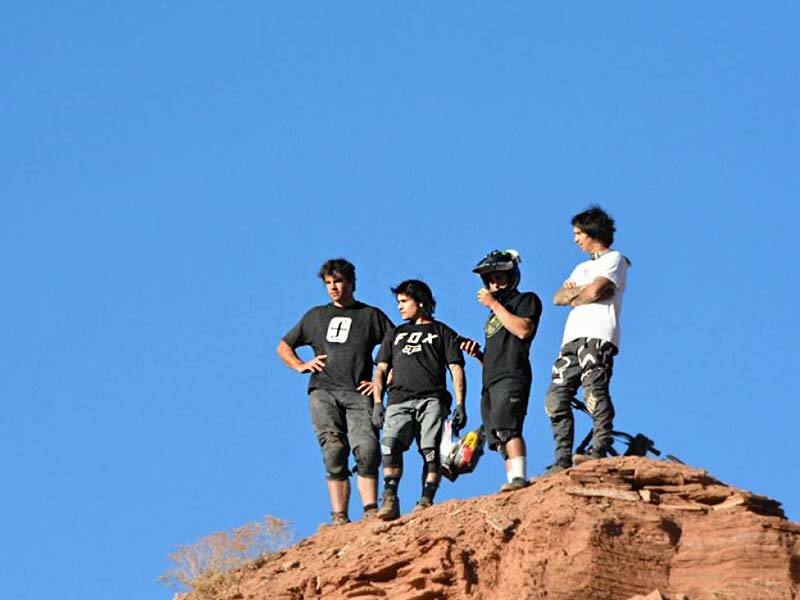 Part of the Commencal USA Development Team. Photo by Liz Mallen. Liz McDonald-Mallen hails from the outskirts of Salt Lake City. 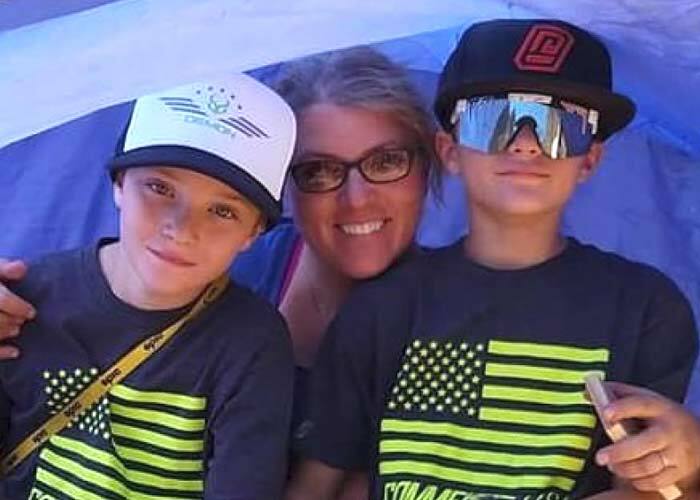 Liz, husband Tony and her twin boys - Luke and Alex are looking forward to spending the winter on skis and bikes. Follow them on Instagram @thosemallentwins. 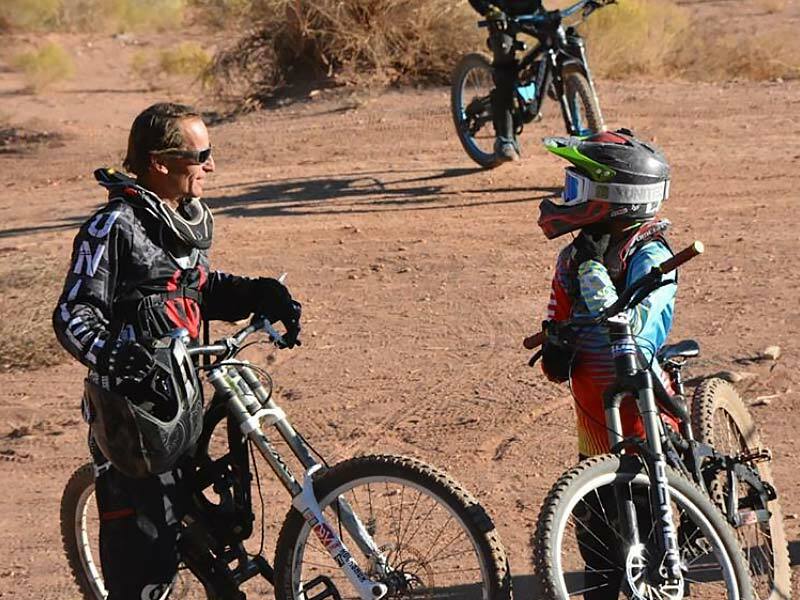 We offer resources and stories for mountain biking families. 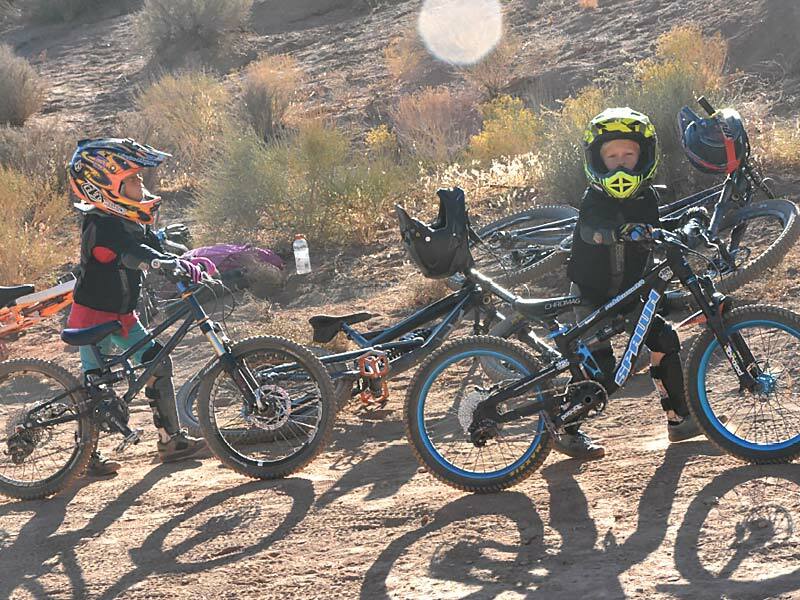 Here, you may find your child’s next bike with our kids’ mountain bikes database. 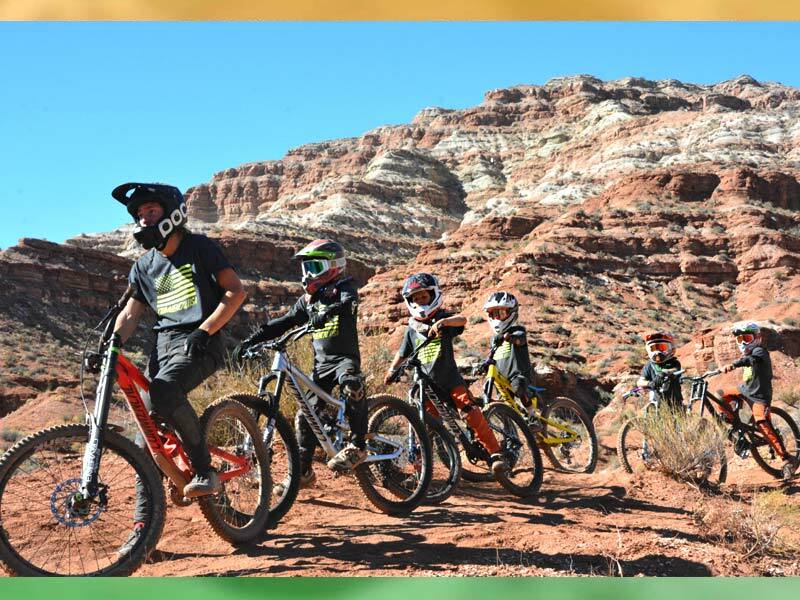 You can also get tips for mountain biking with your kids, read gear reviews, and see some great places to ride your bikes. Do you have a story to share? 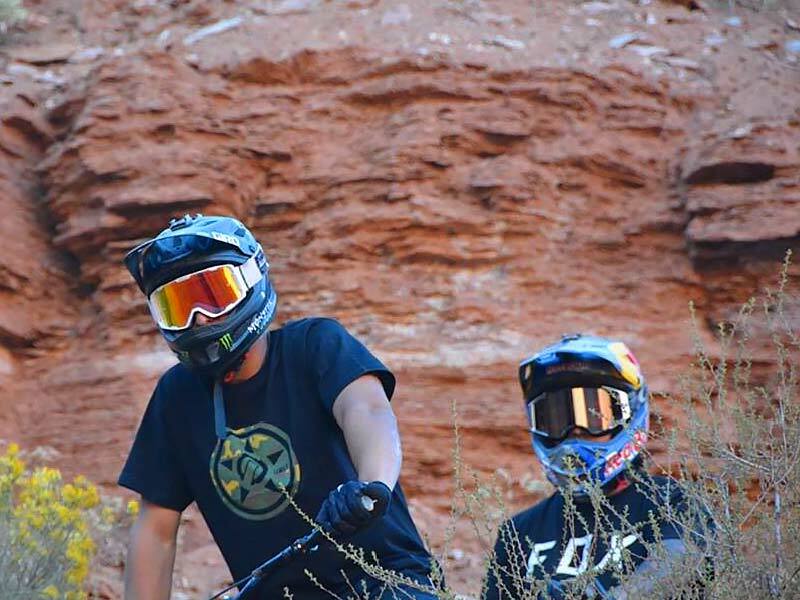 Contact Us and tell us about your family’s latest-and-greatest adventures while mountain biking. 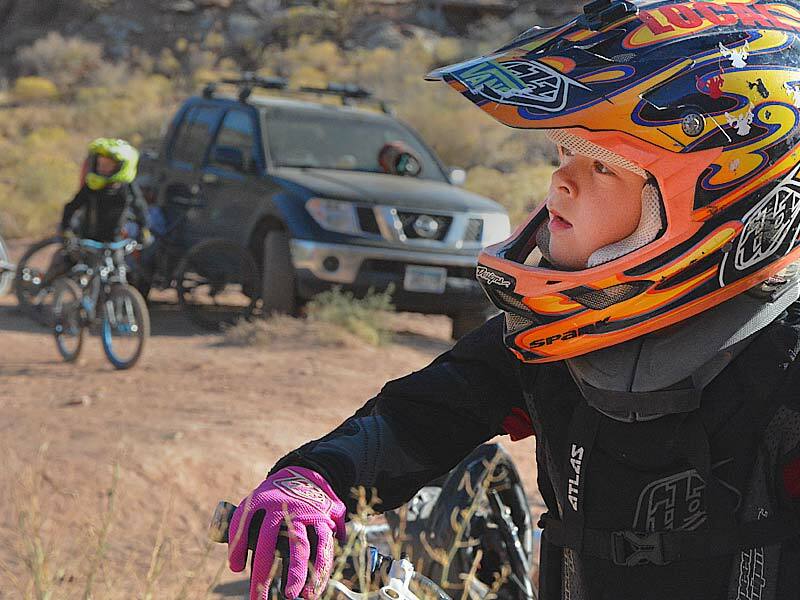 Did you get new mountain bike for your young girl or boy? 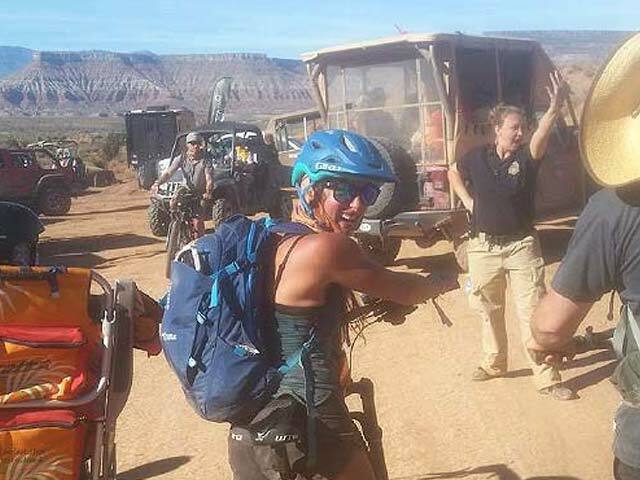 Did they ride a new trail or join a NICA team?